The idea of the American Thanksgiving feast is a fairly recent fiction. The idyllic partnership of 17th Century European Pilgrims and New England Indians sharing a celebratory meal appears to be less than 120 years-old. And it was only after the First World War that a version of such a Puritan-Indian partnership took hold in elementary schools across the American landscape. 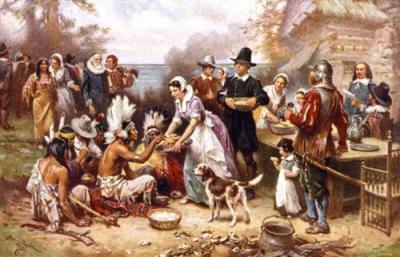 We can thank the invention of textbooks and their mass purchase by public schools for embedding this "Thanksgiving" image in our modern minds. It was, of course, a complete invention, and just another in a long line of inspired nationalistic myths. This day is still remembered today, 373 years later. No, it's been long forgotten by white people, by European Christians. But it is still fresh in the mind of many Indians. A group calling themselves the United American Indians of New England meet each year at Plymouth Rock on Cole's Hill for what they say is a Day of Mourning. They gather at the feet of a stature of Chief Massasoit of the Wampanoag to remember the long gone Pequot. They do not call it Thanksgiving, and there is no football game afterward. Hopefully you have gained some insight into one of our nation's holidays and discovered that not all stories that you read in the history book are true to fact. It sometimes takes a little digging to find the REAL truth.